Found Fifteen (15) more giant hands and these have been added in the Giant Hands Around The World Collection. The Collection now contains 247 hands from around the World. A pair of praying hands at the Mountain of Faith (open air Church? ), Magaliesburg, Gauteng, South Africa. Credits: willi1 (an active member of Google Earth Community Forums) who found the location of this hand. Thank you Willi. Colourful Hands near Kordestan Expy. overpass above 23rd St. near Yousefabad, Tehran, Iran. Located at the Taimur Mosque Roundabout, Al Khuwayr South, Muscat, Oman. 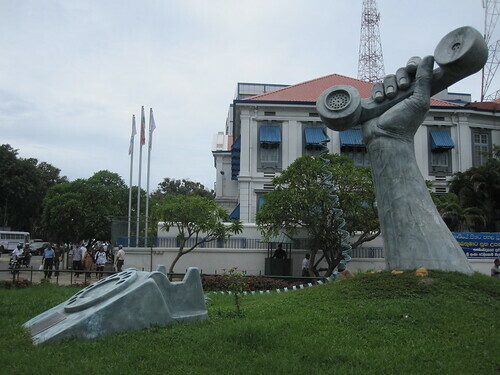 A giant hand holding a handset of a conventional telephone set, located in front of the Sri Lanka Telecom Office, Colombo. Credits: krenek (an active member of Google Earth Community Forums) who informed me about this hand. Thank you Krenek. The peace sculpture, dedicated to “the promotion of a culture of peace and non-violence for the children of the world” - a spiral ascending walkway with its wall having 6000 cast in clay handprints from newborns to elderly. The ceramic work was created by local potter Ross Mitchell-Anyon. A giant hand with a car in its palm, at a roundabout in Brunn am Gebirge, Austria. The text on the hand translates as "Nothing is Impossible". It is an artwork of kunstfelsen.at / Stone Age Art Studio. Credits: willi1 (an active member of Google Earth Community Forums) who informed me about this hand. Thank you Willi. Located on a roundabout in Huriel, France. A giant hand at the Haus der Flüsse (House of Rivers), the Information Centre and theme park of the UNESCO biosphere reserve of Middle Elbe, Havelberg, Germany. This sculpture called "Dirigierende Hände" (Conducting Hands) is located in a fountain at the WHL University of Applied Sciences, (WHL Wissenschaftliche Hochschule), Lahr, Germany. Made of burned clay, it was created in 2001 by Gerald Matzner. I am thankful to Ms. Rena Matzner, widow of sculptor Gerald Matzner for allowing use of above picture from photo collection of late Gerald Matzner. I am also thankful to willi1 (an active member of Google Earth Community Forums) who informed me about this sculpture. 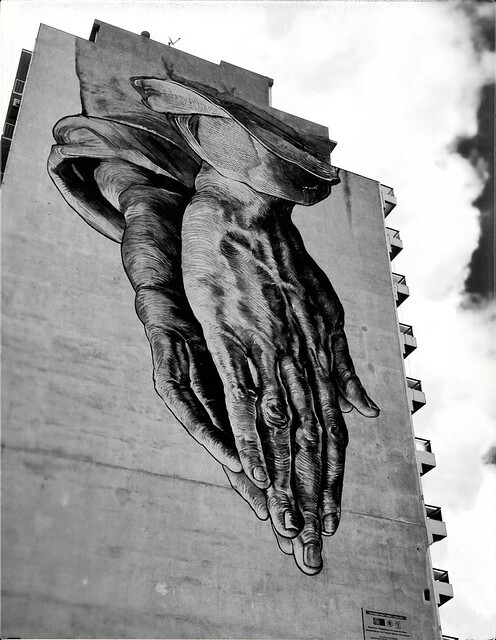 Created by Pavlos Tsakonas and Manolis Anastasakos, this huge mural on the wall of Hotel Vienna, Athens is officially titled "He, is praying for us". Though inspired by Albrecht Dürer's "Praying Hands", the folded hands are pointed down instead of up towards the sky; perhaps implying that "HE" is praying for Greece. Памятник Древо Жизни (Drevo Zhizni Sculpture) (Tree of Life) - A large white hand rising from the ground supporting a tree, West Stachki Ave, Rostov-on-Don, Rostov Oblast, Russia. A similar sculpture "Caring Hand" can be seen at Glarus, Switzerland. The sculpture “Forks at a fork” is located in front of one of the beer restaurants in Kiev. It consists of two golden forks whose teeth have been bend to represent fingers. The thumb and fore fingers of one fork have been folded in to a circle to display OK sign. While the thumb of the second fork points towards the restaurant. 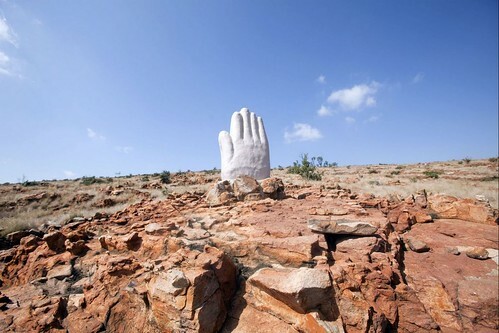 The 4 metres tall sculpture is an artwork of V. Belokon and was installed in April 2011. "Pacem in Terris" (Peace on Earth) is a trans-religious space and sculpture garden created by Dutch-born artist Frederick Franck who made the grounds of his home public. It is full of sculptures spread along paths in the wooded grounds. There are (at least) two sets of hand sculptures in the premises. One set shows a hand of metallic sheet holding a metallic flower. 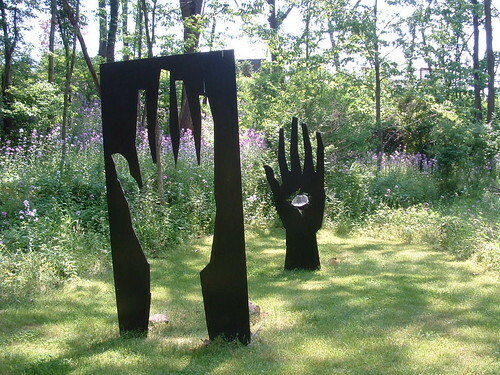 The other sculpture shows two hands; one hand is in negative shape (cut-out) and the other hand is in positive shape with hole in the palm. 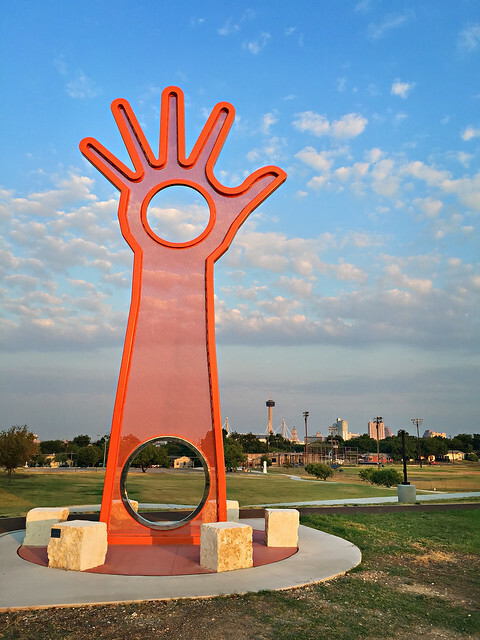 32-foot tall orange coloured open hand, known as the "Open Hand, Open Mind, Open Heart" is dedicated to Dr. Martin Luther King Jr. Made of perforated steel & metal tubing, the open hand with has two 5-foot diameter openings. Located at Pittman-Sullivan Park, which is venue of city’s annual Martin Luther King, Jr. March and commemoration, it is an artwork by Boston-based artist Douglas Kornfeld.